When Viewed: Contents correct as of July 2014. Publisher / Place of Publication: [The Dan Zone / Limerick]? About: At about 4.30 in the morning of April 18th, 1941, an RAF Hampden bomber which was supposed to be on a bombing mission to Germany crashed east of Blessington at Blackhill, Lacken. All four crewmen perished. This account, by a brother of the pilot, was originally privately printed in Oxford in 2000, and attempts to piece together the events leading to the tragedy. Contents: Foreword — What is known of last flight of AD730 — Background of the Hampden and its crews — The Operation of 17/18 April 1941 — How did AD730 come to reach Ireland — Appendices: 1. Operations on night of 17/18 April 1941 (Nos 44,50 & 83 Squadrons) — 2. Record of Hampden raids on Berlin — 3. Operational flights of P/O J.K. Hill — 4. Last letter of Sgt Lamb to his parents (16 April 1941) — 5. Fuller description of Hampden Bomber — 6. Sources and References. Extra #1: Read the online chapters here. Hat-Tip: To Dennis ‘Dan’ Burke for hosting this material online. 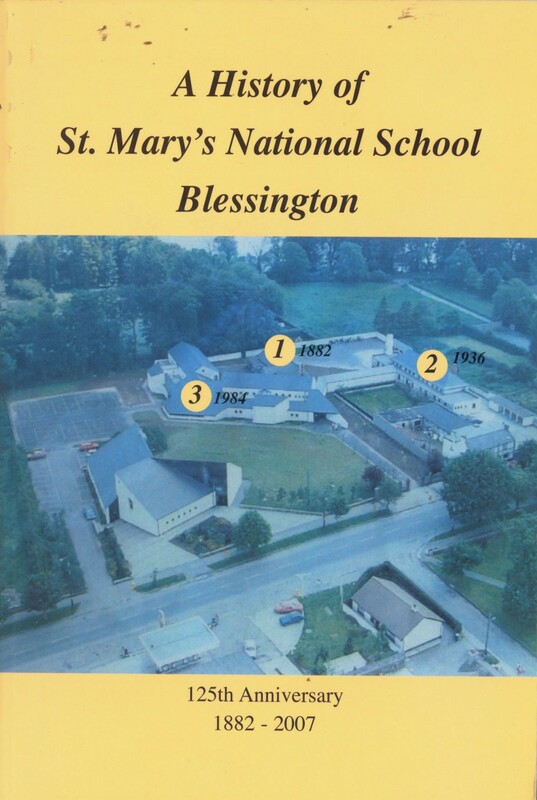 Full title: A History of St. Mary’s National School Blessington: 125th anniversary 1882 – 2007. Publisher / Place of Publication: St. Mary’s National School/ Blessington, Co. Wicklow. About: A book that is a commemoration of 125 years of teaching at the local primary school. It celebrates the history of the community as told through a compendium of short pieces brought to life by past and present pupils. Contents: Chairman’s address – Principal’s address — Introduction – Forewords – Hedge schools / Larry McCorristine – The National School System / Larry McCorristine – Towards a new school: Blessington 1882 – Blessington Catholic Schools – A Lament for Allen View National School [ballad] / Pat ‘Phildy’ McGowan – An Interview with Mr. Frank Murphy – probably the oldest surviving pupil of St. Mary’s – “I learned nothing” / Frank Murphy – Pat Hanlon (aged 93 years), The Rundle, Knockieran – Bridie and Jane Tyrell – “Worse than Purgatory” / Evelyn Hudson – “Never missed a day” / Tom Tyrell – The Blessington Tram [ballad] / Peter C. Grattan – Sheila Walsh, née Boylan, aged 82 years – Billy Crowley – an interview – The Teaching of Religion in the National School – Parish Priests of Blessington Parish – The Church of Our Mother of Mercy / Beth Halligan — The Church of Our Lady of the Most Holy Sacrament / Beth Halligan – Seamus Dowling: the man from Mill House – School in the 1940’s – From Blessington to Baghdad / Joe Halligan – Hampden Bomber Crash Site Blackhill 1941 – Annie Byrne née Geoghegan, Burgage – “The Good Old Days” / Pete Nolan – The Primary Certificate – My Memories of St. Mary’s N.S. 1948-1949 / Ron Charles née Veronica Bohan — Knitting and Sewing – She Taught Them All / Vincent Byrne – Mrs. Elizabeth O’Donnell / Manus O’Donnell – Sean Davin, Principal of St. Mary’s N.S. from 1968-1996 – Memories of St. Mary’s National School, Blessington / Theresa Torsney née Creighton — Memoirs of St. Mary’s / Rena Hennessy – Willie Sargent Remembers – Blessington National School Parents Association – Darren McHugh – Schooldays in the 1980’s / Larissa Nolan – Gemma Ashe (R.I.P.) – Comórtas / Ciaran Duffy – Christy Casey – New Principal – Christy Casey (R.I.P.) – an appreciation – Lisa Frederick-Dunne (R.I.P) – Gerry Brown, Principal of St. Mary’s N.S., Blessington 1999-2007 – German in St. Mary’s 1995-2003 / Iris Rouse – Remembering St. Mary’s National School, Blessington 1995 to 2003 / Ellen Bytyqi, Naseem Nolan & Macha O’Donnell – Sport in St. Mary’s National School, Blessington / Lisa Smith – Turning the Sod / Gerry Brown – 125th Anniversary Mass and Unveiling of Commemorative Stone — St. Mary’s National School, Blessington, Co. Wicklow – List of teachers – Epilogue. Extra #2: Contains dozens of black and white photographs, mainly of local people. Publisher / Place of Publication: Fr. Thaddeus Doyle / The House of Mission, Shillelagh, Arklow, Co. Wicklow. About: The author surveyed people in his parish of Shillelagh to ascertain why some did not attend Mass. The first part of this self-published booklet outlines individual answers to this question and contains a detailed response by the author to each answer. The second half of the booklet contains meditations and readings on the sacrament of the Mass. 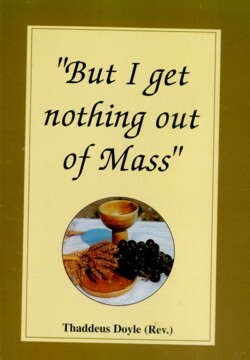 Contents: The survey: my own experience: the challenge – The reasons people give for not going to Mass and their other questions – plus my response – Jesus, His power and presence in the Mass, and what it means for us — Knock – Ireland’s unique Eucharistic apparition — Fan into a flame. Publisher / Place of Publication: James Duffy & Co., Ltd. / 38 Westmoreland Street, Dublin. About: Although this blog has featured descriptions of a few dramatic events in West Wicklow history, this is the first drama to be included. In a letter to the Irish Times in March 2007, Mattie Lennon, a Lacken native, refers to this play as “a thinly veiled account of the Battle of Baltinglass.” The so-called “Battle of Baltinglass” centred around the change of management of the local post office in 1950. Presumably the title of the play refers to the traditional green metal postbox inset in the walls of post office premises throughout the country. 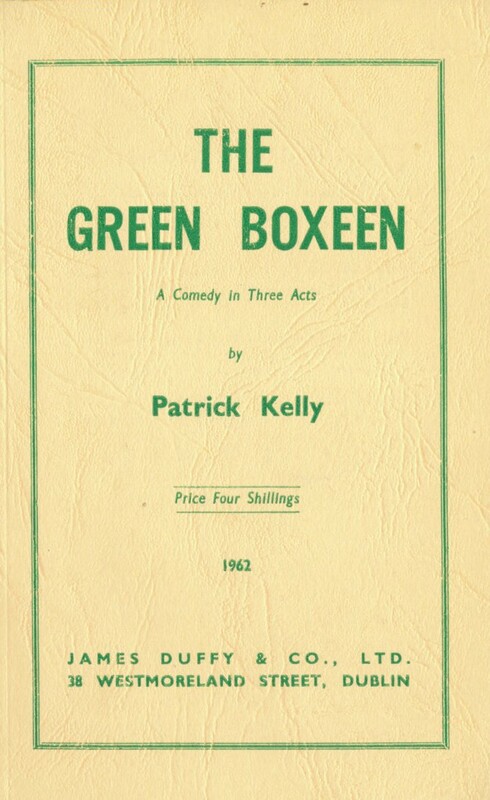 The play was first broadcast on Radio Eireann on June 22nd, 1952. Contents: Scenes: Act I: Brophy’s Bar and Grocery one Friday morning in August – Act II: Same a month later – Act III: Same a month later than Act II. Extra #3: The play won First Prize in the Radio Eireann drama competition. Extra #4: The play won First Prize in the Sheridan Centenary Play competition organised by the Book Association of Ireland.